Let the holiday celebration season begin! As part of the POPSUGAR Insights 2017 Holiday Report, we asked 3,000 US women to tell us if they plan to entertain during the holiday, the types of foods they plan to serve, and what foods and beverages they love the most. Overall, 1 in 3 millennial women plan to host and entertain friends and family this holiday season, while 61% plan to go to someone else's home to celebrate. Millennial women who plan on hosting events are likely to host informal dinners (31%), drinks and appetizers only (14%), and formal dinners (13%). 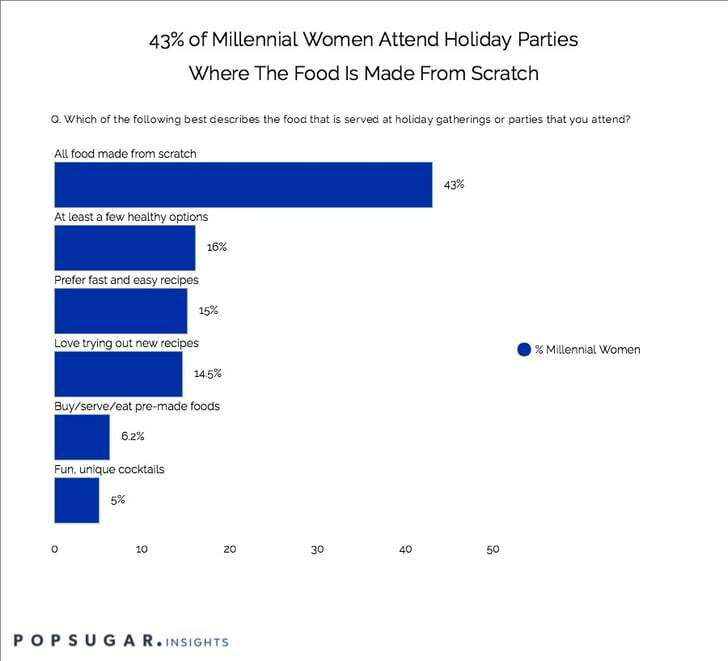 Millennial women describe the food that is served at holiday gatherings they attend as "made from scratch" (43%), offering "at least a few healthy options" (16%), and made from "fast and easy recipes" (15%). Fifteen percent of millennial women love trying out new recipes, and only 6% buy, serve, or eat pre-made foods. When attending someone else's home for a holiday meal, millennial women are most likely to bring a "dessert they made" (27%), followed by "food they made" (25%), and that old standby, "alcohol" (19%). In terms of the most popular foods and beverages consumed at holiday get-togethers, eggnog remains the number one food or drink of the holiday season, followed, not surprisingly, by pie.